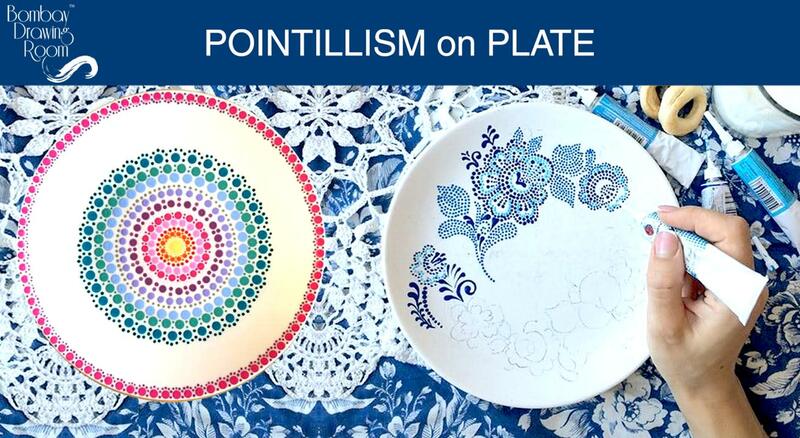 Bombay Drawing Room brings you a Pointillism Painting on circular Plate at Independence, Andheri. #Pointillism is a technique of painting in which small, distinct dots of color are applied in patterns to form an image. The simple dot style as well as cross hatching maybe beautifully aesthetic to the eye but has a far more hidden meaning and deeper purpose; to disguise the sacred meanings behind the stories in the paintings. The pointing technique gives the painting an almost 3D effect and a sense of movement and rhythm. It is also known to be therapeutic & calming. Have yourself a relaxing Sunday morning while you paint your masterpieces. Founded by a self taught Artist Snehal Patil, Bombay Drawing room is an initiative that fosters fun and non judgmental environment that was created by the vision to encourage creative expression in everyday settings.